If the brush piles to be burned are located within city limits, check local laws and permit requirements before burning. 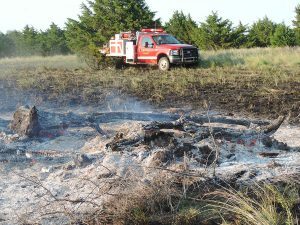 For more information about burning within the law consult the publication Notification requirements and considerations for safe and lawful prescribed burning in Oklahoma at: http://www.forestry.ok.gov/Websites/forestry/Images/burnlaw.pdf. 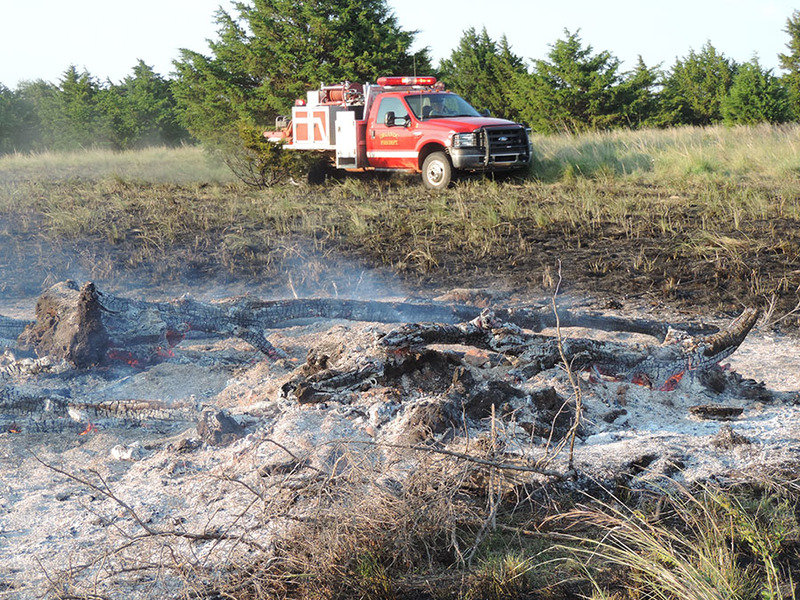 Debris burning, which includes brush pile burning is one of the main causes of wildfires in Oklahoma. Brush piles within burn units are also one of the main causes of escaped fires for people conducting prescribed burns. 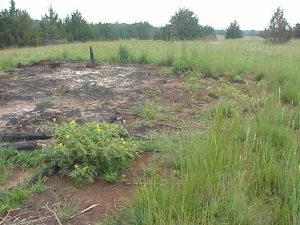 Burning of brush piles can be difficult and a major problem for landowners if not done correctly. • Best time to burn piles is May through June. • Have adequate suppression equipment available. • Make sure extended weather forecast calls for winds less than 15 mph and relative humidity greater than 40 percent. • Notify local fire department and neighbors. • Use other methods, such as grinding or scattering if fire is not a viable option for removing brush piles. From a safety standpoint, time of year—or season—is the most important consideration when burning brush piles. May and June are generally the best times of the year to burn brush piles to minimize risk of escape. This time of year is best because the surrounding vegetation is usually actively growing with high moisture content. Burning brush piles during May and June reduces the probability of escaped fires. If a fire does escape, the fire behavior typically is slower moving and with shorter flames, making it easier to extinguish. Remember even though the vegetation is green, if there is enough old growth from previous years, a fire will still burn in the green vegetation. So make sure to monitor the pile while it is burning and have adequate suppression equipment available. Contrary to popular belief, burning piles during the winter with snow on the ground is not advisable, because snow normally melts within a day or two in Oklahoma. Dormant vegetation will dry out very quickly during the winter after the snow melts. Grass fuels are considered 1-hour time lag fuels, which means it takes about one hour for those fuels to be as dry as the surrounding atmosphere. A brush pile burned one day with snow on the ground may be smoldering the next, when warmer temperatures melt the snow and strong winds dry out the adjacent fine fuels, blowing embers from the pile, igniting a wildfire. Remember, brush piles can smolder for several days, even weeks, and are an extreme fire risk when ignited in the dry, dormant conditions of winter. May and June are the best times of the year to burn brush piles because the surrounding vegetation is usually green and actively growing. Burning brush piles during May and June reduces the otherwise high probability of escaped fire, and if a fire does escape, fire behavior is typically slower moving with shorter flames, making it easier to extinguish. Always have adequate suppression equipment available when burning piles. Current weather conditions are another major concern when burning brush piles. Wind speed should be the first weather condition checked prior to burning. High winds are the major contributor to wildfires here in Oklahoma. Brush piles should be burned when wind speeds are less than 15 mph and not gusty for an extended period of time. Also, wind direction should be considered to keep embers and smoke from becoming a problem downwind. Relative humidity is the second most important weather variable to consider before burning piles. Burning brush piles when relative humidity remains greater than 40 percent can reduce the chances of embers igniting spotfires downwind. Most of the fuel in a brush pile is comprised of tree limbs and trunks, which are considered 100-hour or 1,000-hour time lag fuels. Therefore, brush piles can often be burned on a day when relative humidity is high or even when it’s raining if the larger fuels have been dry for an extended period of time. Understanding this relationship between relative humidity and fuel moisture is important in order to minimize the risk of escape when burning a brush pile. Consult the OK-Fire website at: http://okfire.mesonet.org for current weather conditions, forecasts and 100- and 1,000-hour fuel moisture readings in your area. When a suitable day is selected for burning a brush pile, check the weather forecast for at least the next three days. Remember, most brush piles do not completely combust in one day. Some may smolder for days or even weeks, especially when those brush piles contain large amounts of 1,000-hour time lag fuel (e.g., tree trunks), or if large amounts of soil were pushed in the pile. To reduce problems and to minimize the risk of escape, be sure the weather is going to be suitable for several days following the initial burn of the brush pile. If the weather is not going to be favorable, delay the burn or monitor with adequate fire fighting equipment until the weather is no longer a problem, which may be several days. Brush piles should be burned when wind speeds are less than 15 mph and not gusty. Also, wind direction should be considered to keep embers and smoke from becoming a problem downwind. Burning brush piles when relative humidity remains greater than 40 percent can reduce the chances of embers igniting spitfires downwind. Controlling brush pile size can reduce the risk of the fire escaping. 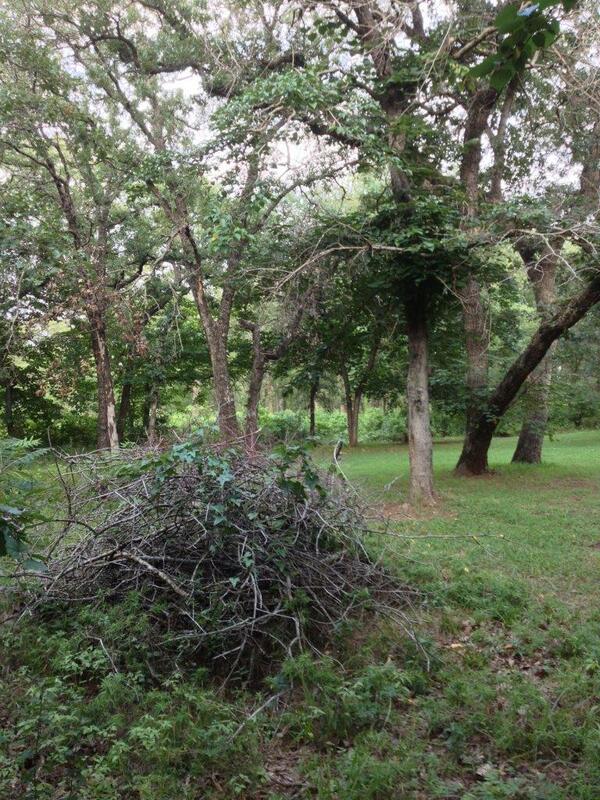 Making brush piles small and compact will reduce the overall intensity and flame size of the pile. Smaller brush piles will also reduce the amount of smoke produced. Making smaller brush piles creates more piles to burn, but often this minimizes the risk of escape, and smoke management are more important concerns than the number of piles. Another way to minimize the risk of escape when burning brush piles is to wait until the fuel in the pile has higher moisture content; this will reduce fire intensity, but there may be problems with smoke, along with keeping the brush pile burning or completely combusting all the fuel in the pile. Care should be exercised when igniting brush piles. There are several ways to ignite a pile, but it is important to make sure that the brush pile is ignited safely. 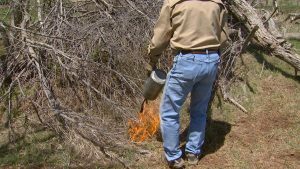 A drip torch, fusee (road flare), propane torch, or placing flammable fine fuel, such as hay or paper in the brush pile and lighting it are all safe methods. Igniting piles by pouring flammable liquids on the brush pile, followed by a lit match should be limited to less flammable fluids such as kerosene, charcoal lighter fluid, or an equal mixture of diesel and gasoline. Only pour flammable liquids on a small portion of the brush pile before igniting. If the brush pile does not ignite, be absolutely certain that all flames are extinguished before adding more flammable fuel and re-igniting. Do not try to ignite brush piles with gasoline due to its low flash point, highly flammable properties, and vapor, which is heavier than air. Using gasoline is very dangerous and can lead to serious injury and an escaped fire. There are also ways to ignite a brush pile to reduce fire intensity and flame length, thus reducing the risk of escape. 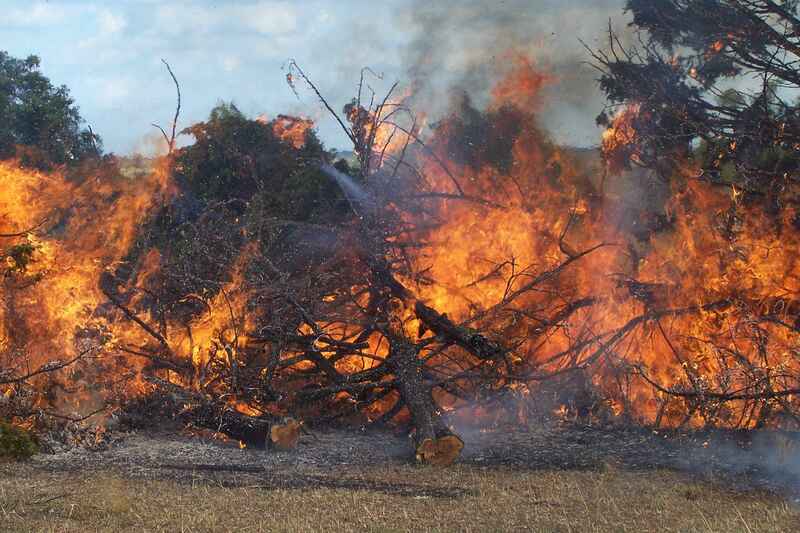 Igniting a brush pile on the downwind side will create a backfire (a fire moving or burning into the wind), causing the pile to burn slower, with lower heat intensity and shorter flame lengths. The brush pile will take longer to burn, but this is a good method to use when containment outweighs the amount of time needed to burn the brush pile. When monitoring burning piles, continue to consolidate the partially combusted fuel next to the brush pile to make sure all fuel is consumed and prevent it from being a pathway for fire to escape. Care should be used to prevent injury or equipment damage when working around the burning brush pile. It is best to perform this task with a front-end loader (or similar equipment) or by hand with a heavy-duty rake after most of the brush pile has burned. Because of the amount of coarse fuel piled in a small area, heat effects on the soil can be extreme. In severe situations, the soil can become temporarily sterile and remain void of plants for an extended period of time. This can be somewhat avoided by burning brush piles with high fuel moisture content or when relative humidity is high, but be aware that this will increase the amount of time required for the brush pile to completely combust. The areas of bare soil are temporary and may create an opportunity for different plants to become established. In native plant communities, an ecological process called plant succession will reverse this situation over time. Another concern about burning brush piles is the impact of heat on overstory trees. If brush piles are created in a forested or timbered setting, heat generated from burning can top kill many of the surrounding trees. Therefore, select appropriate areas to locate brush piles or consider scattering the debris and following up with a prescribed burn to reduce the impact of heat on the overstory. Because of the amount of coarse fuel piled in a small area, heat effects on the soil can be extreme. In severe situations, the soil can become temporarily sterile and remain void of plants for an extended period of time. The areas of bare soil are temporary and may create an opportunity for different plants to become established. In native plant communities, an ecological process called plant succession will reverse this situation over time. Brush piles are most often removed for aesthetic reasons or because they are simply in the way of other land use activities. However, they are not inherently bad. 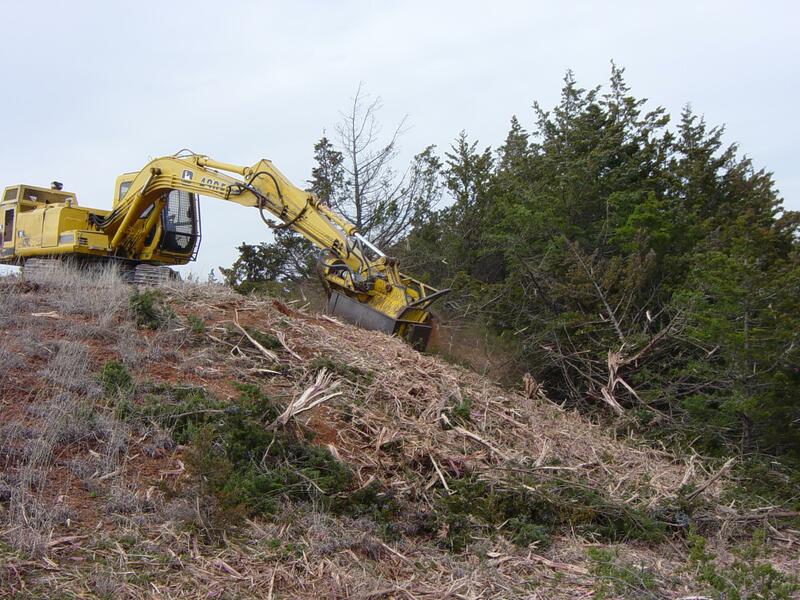 Brush piles can be left alone and allowed to decompose over time or to provide different habitat structure for wildlife. Species of wildlife using a brush pile depends on its composition. 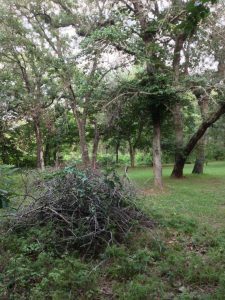 Brush piles comprised of a lot of small branches and limbs may attract a certain group of birds, mammals, reptiles and amphibians, whereas brush piles comprised mainly of large tree trunks may attract an entirely different group of wildlife. Brush piles usually provide the best cover for wildlife during the first two or three years or before they become too decomposed and more tightly packed. If leaving piles to decompose is not aesthetically acceptable and burning or mulching is not possible, consider scattering the debris. 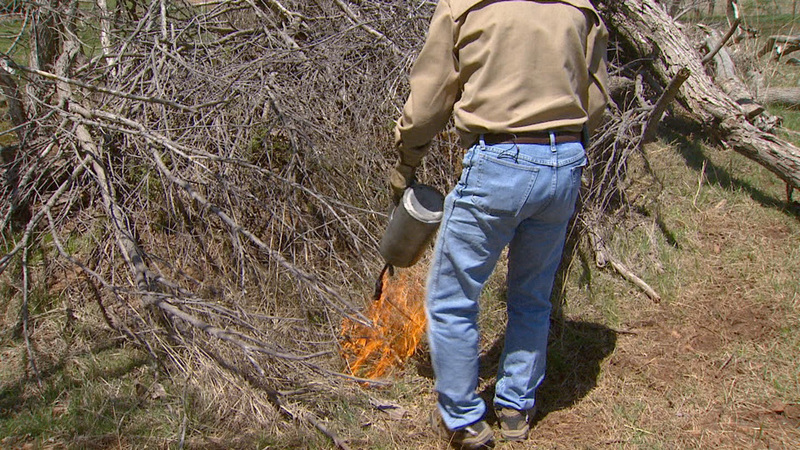 This disperses the fuels and reduces problems, especially if prescribed burning will be used in follow-up management. Grinding or mulching the brush pile is another alternative to burning. It is much more expensive, but may be the only alternative when concerns about escaped fire is a major consideration or if the brush piles are located within city limits or other areas where burning is not practical or allowed. Grinding or mulching the brush pile is another alternative to burning. It is much more expensive, but may be the only alternative when minimizing the risk of escape is a concern or if the brush piles are located within city limits or other areas where burning is not allowed. In forested or timbered areas, the heat generated from burning brush piles can top kill many of the surrounding trees. Therefore, select appropriate areas to locate brush piles or consider scattering the debris and following up with a prescribed burn to reduce the impact of heat on the overstory.